I can attest that a custom closet can save you time and money. 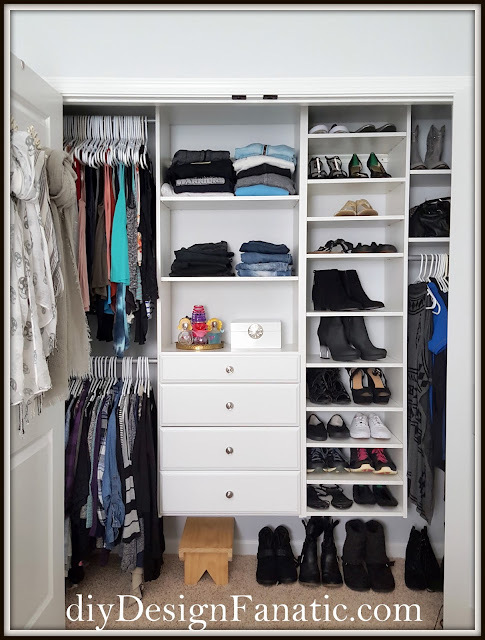 Having custom closets in your home can also help it sell faster and may even increase the bottom line. Wire closets, on the other hand...not so much. They are probably at the top of my "have to change" house list, even before laminate countertops or the dreaded popcorn ceiling. Thankfully, we have granite countertops and smoothe ceilings in this house. 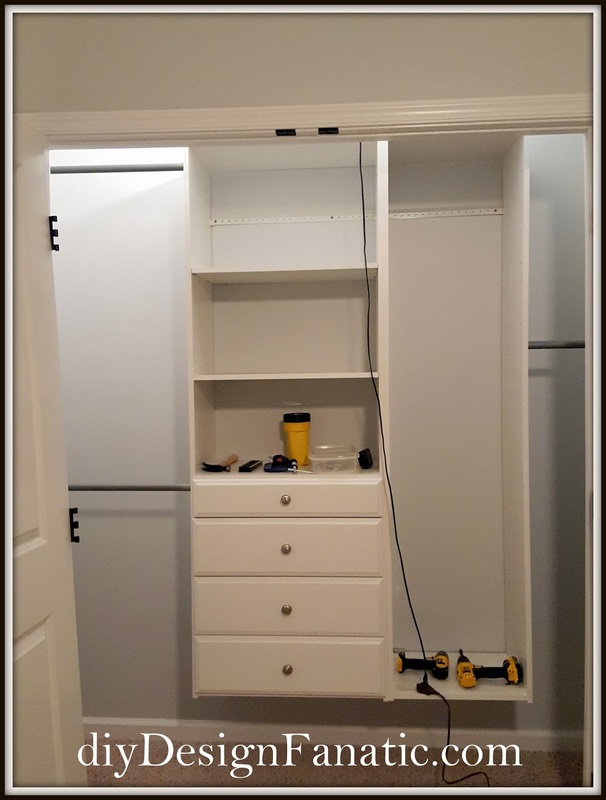 We replaced the builder grade wire closets in our last house with custom melamine closets in all the bedrooms except the guest room. 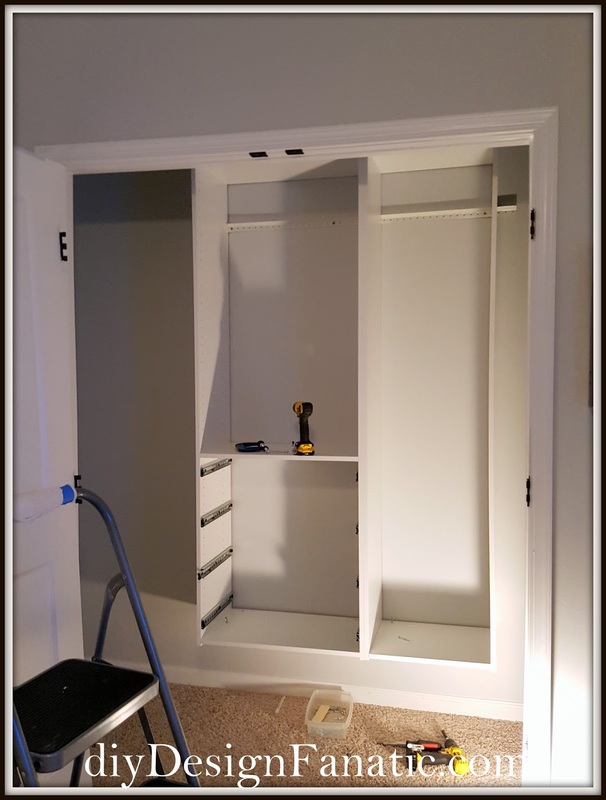 I designed custom closets at the time we purchased our last house, so our master bedroom closet was the first space we replaced. Once you have a custom closet, it's difficult to go back to wire. 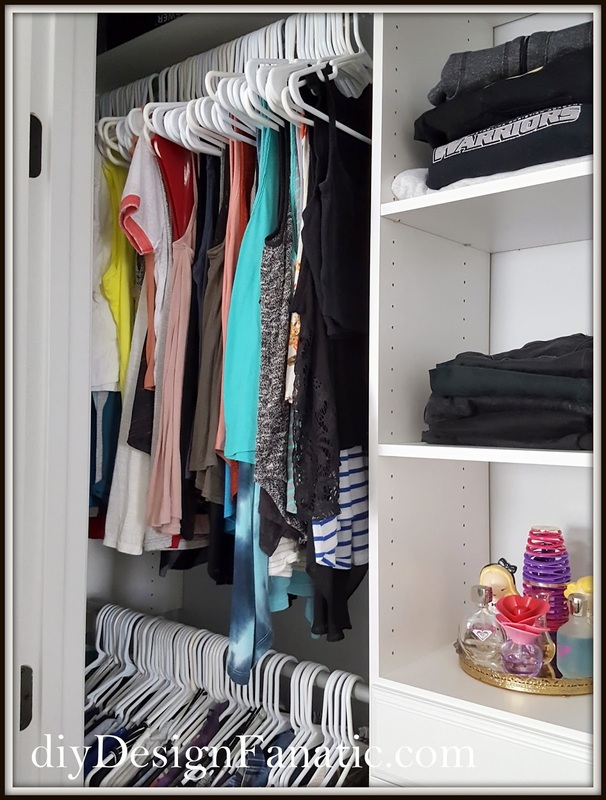 An adjustable melamine closet is a much better use of space and the shelves are so much easier to clean. Our master closet is too large of a project to do right now, so we decided to replace the closet in our daughter's room first. 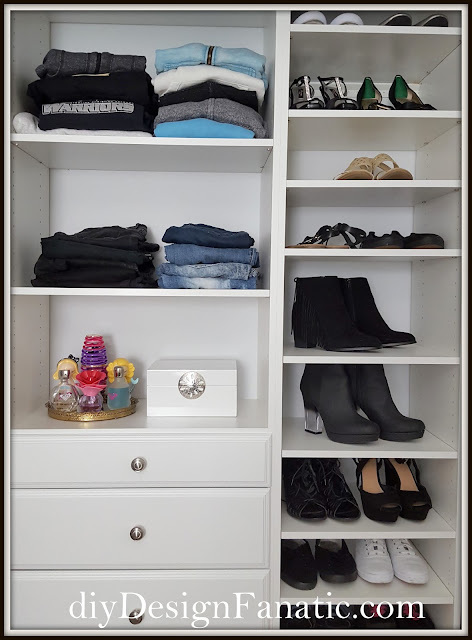 She did a great job organizing everything in her closet, but it wasn't ideal and didn't have any drawers like her last closet did. I looked at closets from various stores and decided on a melamine organizer from Martha Stewart Living on the Home Depot website. At the time I was looking, these were on sale and we had additional coupon. 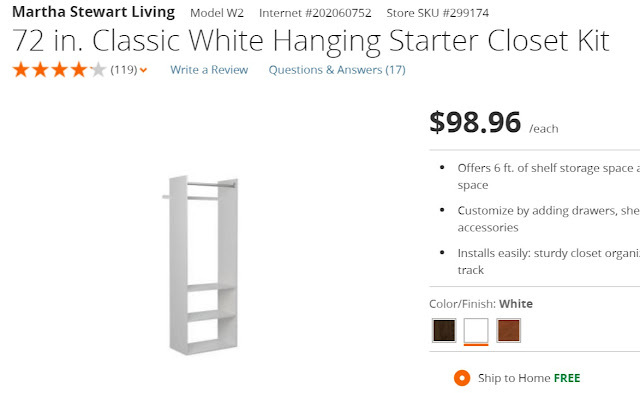 a hanging closet starter kit for the shoe shelf section and a few extra shelf packs. Martha Stewart offers a shoe shelf section with slanted shoe shelves(which we didn't want) and a shelf section with more shelves, but it was less expensive to order this unit and some extra shelves. 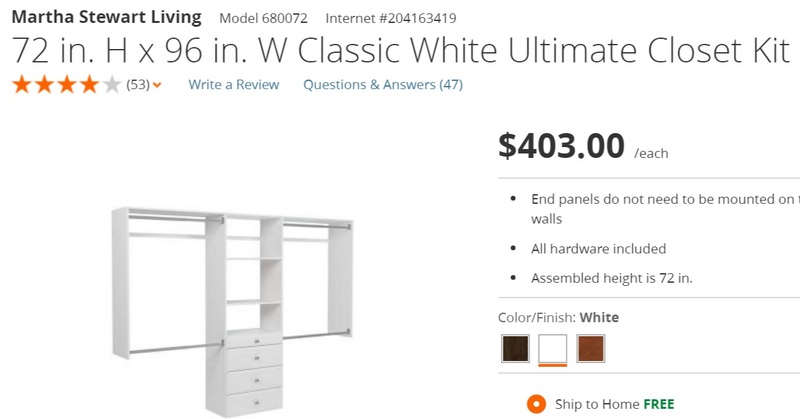 Everything was taken out of the closet, the wire shelves removed, the holes patched and the walls painted the same color as the bedroom walls. This took most of a Saturday. We cut the shoe shelves section down to 16 1/2" (from 24") to allow for the space needed for long and short hang. 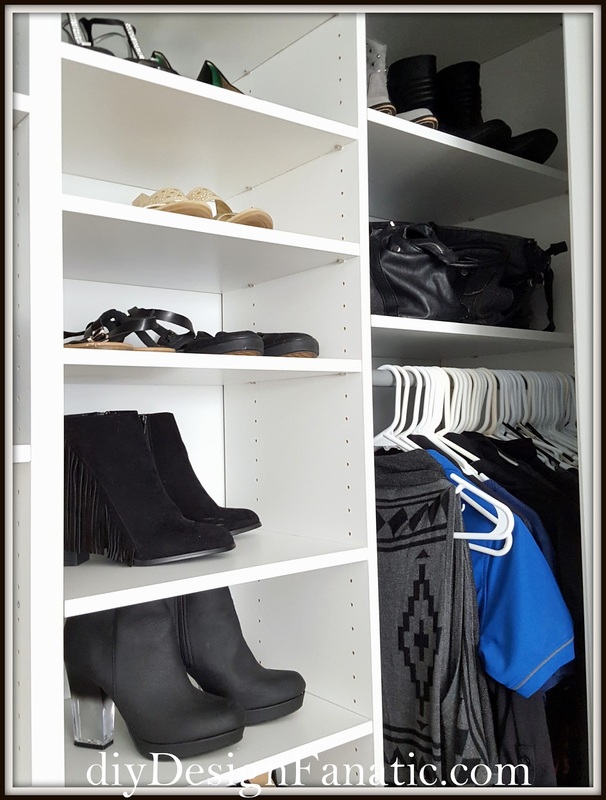 16 1/2" was enough space needed for 2 pairs of shoes on each shelf. The closet system sections are hung on a rail and attached to the wall. Once those are installed, the drawers can be put in and the hanging rods installed. We installed the double hang about 41" apart- the top rod is installed a couple inches down from the shelf above. The long hang is installed at about 57" from the floor. This is where Mr. DIY finished on the first day. He installed the top shelves and cut down more shoe shelves the following day. Our daughter couldn't wait to put her clothes back in the closet! The rods and shelf were cut down to 33" wide making the total space for short hang 66". The rod and shelf above was cut down to 21" wide for long hang. 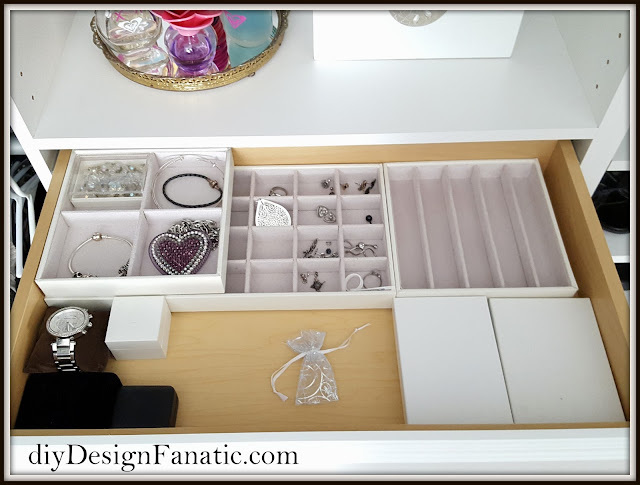 The top drawer is shallow and perfect for holding jewelry. Our daughter brought the hooks she used at our previous house. We will also be installing a towel bar below to hold additional scarves. So what's on your "have to change" list? Would love to know! Thanks Wendi! 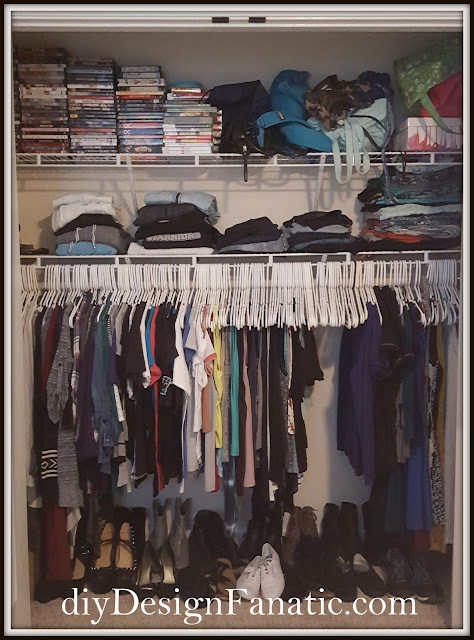 Our master closet is a disaster, as well. I can't wait to finish that project! What an enormous difference!...great job as usual!....and to think you did all that for a little over $500 is amazing!! !